Firing is a critical process step at every enameling shop, because it determines the esthetical and functional properties of the fused enamel coating. In order to continuously achieve good enameling results, it is important to maintain the actual firing conditions at the enameling furnace within strict tolerances. 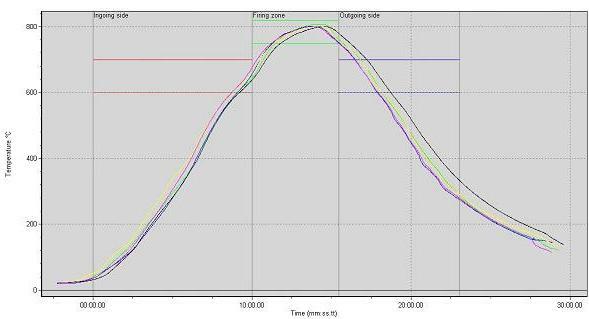 Regular verification of the actual temperature profile measured on the enamelled object is therefore a common procedure at industrial enameling plants with ISO 9000 quality assurance systems. Companies with only one enameling furnace and a verification frequency of once per year, will typically outsource these temperature surveys to a specialized company. Ditmer Trading & Consulting BV has the necessary equipment to measure temperature profile(s) at your enameling plant. Companies with multiple furnaces and/or a high verification frequency, may consider to perform this test inhouse and purchase a state-of-the-art furnace tracker via our webshop. Beneath a typical example of a temperature profile at a double hooked U-type continuous enameling furnace for cooker components. 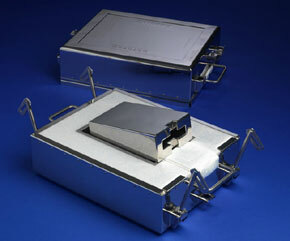 Traditionally temperature measurement within continuous enameling furnaces was done with a so-called Bozsin box. These large & heavy insulated boxes contained a full-size working temperature recorder with paper printer, which was connected via one or multiple thermocouples to an object while both being suspended at the furnace conveyor and passing thru the enameling furnace. Upon completion of the test run this data logger is connected with a laptop or PC and the collected data may be processed & analyzed with advanced software. See our webshop for more details. Optionally it is even possible to have real time data transmitted from the furnace tracker. As mentioned previously, DTC may perform furnace surveys and measure temperature profiles at your facilities. We are specialized in providing worldwide professional services & supplies to the porcelain (vitreous) enameling.